Firefox 3 (FF3) Smart Location Bar, or commonly regards as Awesome Bar has lot of enhancements and improvements, making it a world apart from original Location Bar in old version of Firefox 2 (FF2). One of the change to Location Bar in FF3 is cosmetic. Instead of just listing the matching URLs as AutoComplete feature while user types text in the Location Address Bar, the Firefox 3 Location Bar takes up 2 lines. The first line displays website or page title, site favicon and whether it has been bookmarked, while the second line shows the URL link location. For user who doesn’t prefer these ‘rich’ format Location Bar in FF 3, and want the simplicity format of Address Bar in FF 2, it’s possible to kill the Awesome Bar and revert back to the old good reliable Location Bar in earlier versions of Firefox, with Firefox 2 style URL bar search results. To do so, download and install oldbar add-on. Do take note that the extension only change the presentation of the URL address bar when showing Auto Complete matching results. 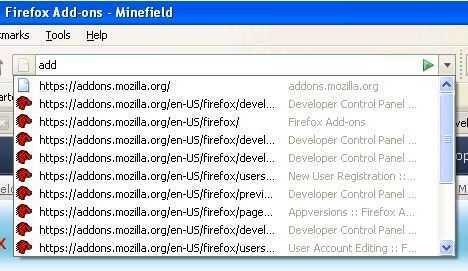 The underlying AutoComplete algorithm is still the Firefox 3 algorithm, which matches also entries from bookmarks, tags, recently visited sites and directly typed into URL address bar items, unless user chooses to disable the inclusion of ‘rich’ results from AutoComple algorithm to just recently typed in URLs.